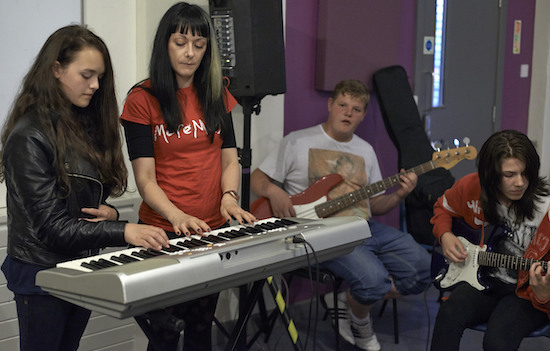 More Music’s songwriting workshops are aimed at helping to develop language, creativity, and self-expression. As well as reading skills, including sensitivity to phonetics and an awareness of poetic devices such as metaphors and alliteration, and develop written language, building vocabulary and improving spelling. The workshops can be done within or aligned with any thematic or curriculum area of your choice. Songwriting is ideal for bringing history to life, describing people and places, telling stories and much more. The process begins with knowing yourself, how you feel and challenges you to write your message into precise words, using the linguistic building blocks and song-writing conventions to guide you. The mental activity involved is complex and full of opportunities for learning of all kinds, but incredibly satisfying when everything falls into place.